Following our recent criticism of 2011 Best Animated Feature Oscar nominees, let us review a not so recent animated film from Japan. It is a rare jewel among animation movies and although children are its main characters it is definitely not your average children animated story. We are talking about the 1988 film Grave of the Fireflies (Hotaru no haka in Japanese) portraying unforgettably the wartime life in Japan during World War II. Grave of the Fireflies (Hotaru no haka) is a movie about two kids, young boy Seita and his little sister Setsuko. Their father has been mobilized in the Japanese army during World War II. Towards the end of the war, their mother dies from her burns caused by a recent firebombing. Remaining without any adult cares, the children shift to live with their aunt. But after a while, the kids' opinion on everyday activities grows different from their relative's view on life. The quarrels with the aunt become more and more frequent (due to a growing lack of food) and finally they leave her house to live in an abandoned bomb shelter. The children's struggle with the wartime reality is what the rest of the film represents in a very memorable way. Grave of the Fireflies is about innocent children and adults who suffer because of other people's mistakes and mental defects. It is a movie about humans losing their humanity under critical conditions. It is about war, orphanage, death, famine, love, indifference. It is among the very few animated films that could bring you to tears. It is an innocent movie that does not preach, nor even point who are the good and the bad guys. Grave of the Fireflies (Hotaru no haka) is based on a semi-autobiographic novel by Akiyuki Nosaka and it is often viewed as an anti-war movie due to the events it depicts. For sure, it is not a typical animated feature. The narrative and the characters are what make the film really powerful. There are not gorgeous animations, visuals or sound effects. It's just the story of the two kids that blows your mind. If you've watched this movie and you haven't dropped a tear until its end or you haven't been deeply touched to the heart at least, you probably do not have a heart. Many of the comments coming by professional reviewers or just regular cinema lovers in regard to Grave of the Fireflies have not been less moving than the film itself. The movie has found warm reception pretty much everywhere. With quotes ranging from just a "tragic film" to "The best movie you'll never want to see again", it seems almost everyone who has seen this movie at least once in his life has been deeply affected. People have been asking "What scene did you start weeping at?" or "How much time did you cry?". 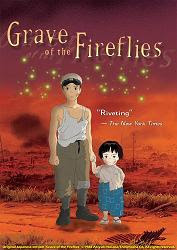 Roger Ebert, a well-known critic, considers Grave of the Fireflies to be among the most powerful anti-war films made in the history of cinema. So, if you've missed to watch this exceptional movie gem for whatever reason, buy the DVD or Blu-ray disc, or simply find another way to see it. And since the film could easily win the title of the Saddest Animation Ever, you may even legitimately shed some tears, no matter whether you're a child, a woman or a man, because you'll be just the next in line to join the rows of many other weeping viewers. Read more movie reviews in our Review Maze.